Syndicate representatives have announced a new Item, available as of now: the Negotiator! Previously, Commanders were limited to negotiating or renegotiating just one Contract at a time. However, purchasing and activating a Negotiator will give your Base extra processing power, allowing you to work on two Contracts at once! If a Special Offer containing the new Item is currently active, there will be a special icon whenever you view a Contract. Clicking on this will take you to the Bank, directly to the Special Offer in which the Negotiator can be found. From there, simply make your purchase to take advantage of all the benefits your new Negotiator will yield! After you have purchased your Negotiator, you will need to activate it. To do this, go to Black Market > Misc. > Special, and click on the “Activate” button next to the Item. 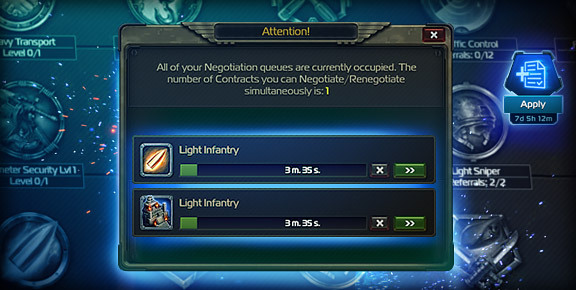 Alternatively, you can activate the Negotiator directly from the Contracts window. Your Negotiator will benefit your Base for 7 days after it is activated. For example, if your Negotiator has 1 hour remaining, and you assign a Renegotiation lasting 2 hours, the Negotiator will still finish the job. We must make the most of our PMC contracts to claim Zandia from ZHG! Use Negotiators to start collecting those signatures, Commander!